Picture and descriptions of different sizes and variations of the Boar survival knife. Hand forged from lumber mill saw blade. Handmade working art from British Columbia, Canada. Hand forged survival knife with a fixed high carbon steel blade. A few years ago a man squatting in the bush raised pigs. Lots of pigs. He ran out of money and decided to let them out to range in the bush. They ended up invading some folks’ garden. 6 times, each time more came. The folks hiked to the location where he had his pen. Left a note. The second time a note on a tree beside his road. Full days warding off the pigs. The third day they visited his 85 year-old mother. Invited her and her son to dine. They ignored the folks’ invitation. The boar was at least 400 pounds. The pigs were digging up their gardens, they dug up a 5 year-old apple tree. The promise of a full root cellar in the fall was evaporating. The folks knew this was a problem. The Forest people got involved. Told the folks they could shoot them on site. They asked if the police could help. The police said if they didn’t deal and work it out between themselves they would come in. If they came in they were going to do something….nobody needs that, the folks thought. Word got out that his boars were in the bush. In a couple of weeks the pigs and the squatter were gone. The Boar. Custom sheath motifs. Please go to our Custom Sheaths page and view the designs and options we offer. The Boar with a melted brass and copper, forged, peened copper and brass finger guard. 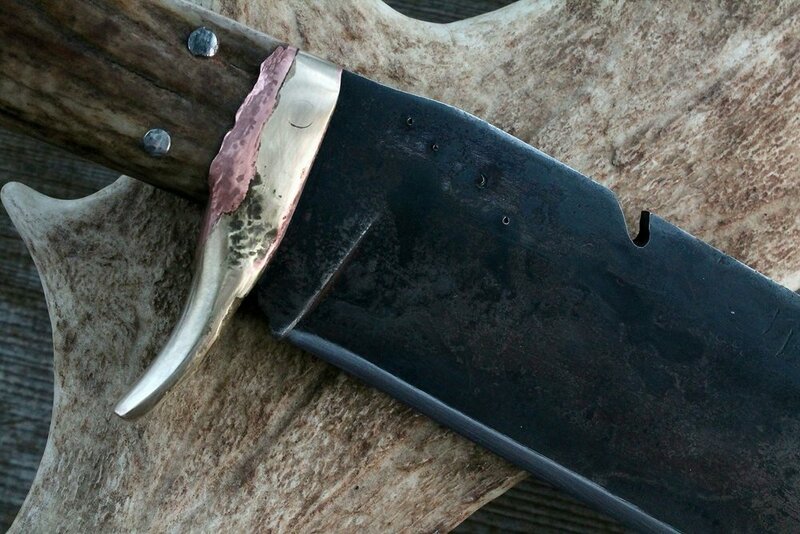 The Boar hand forged survival knife. Moose antler scales, brass and stainless pins, copper and brass guard, clipped drop point, 7 “ blade, 1/4” spine . Steel we recover from mill saw. Small hand forged drop point 3” hunter. A Boar neck knife. On our Featured Work page. For information and price go to our online catalogue page at the Boar knife gallery. High carbon lumber mill saw blade steel. Knives and tools steel stock. Custom made sheath design & security. Custom built sheath with a dangler belt loop, fire steel, custom tooling and leg straps. Custom motifs tooled into the leather. Raven sheath. Head saw blade is a high carbon steel. With a tough tensile strength that keeps a strong edge. An excellent steel for big woodworking tools and survival knives. Hand forged survival knife, 10 inch Boar. Hardened and differentially tempered, blending tempers for strength and toughness. The finger guard is fashioned from copper and brass. Moose antler scales held with 10 pins. 12 inch Boar Survival blade, brass and copper guard and moose antler scales. We melt copper into brass, peening and shaping. Notches are cut in the spine for camp. This knife will chop and slice. Peened copper into brass into moose antler scales held with stainless steel threaded pins. Clay hardened and we differentially temper spine with a torch and tempered 3 times again in an oven for a strong edge and a tough blade. We forged the knife from head saw steel. The tip, spine, choil and tang were protected with a thicker layer of clay. The rest of the blade, except the edge, was covered with a clay slip. While the clay slip was still wet we covered it with pulverized glass. Hardened in oil twice. Tempered the spine and tang blue. The whole blade was then tempered in an oven 3 times for a strong edge. We tested it on a 4 x 4 piece of oak. Could have chopped it in half easily. Moose antler scales held with 8 threaded and peened pins. Drilled a lanyard hole and braided a short lanyard. The guard is a big piece of brass forged with copper. The sheath was cut and made from 8 oz. leather, double saddle stitched, tooled and dyed. All by hand. We equipped the scabbard with a leg tie. The boreal forest is the theme. Visit the Boar knife gallery on our online catalogue for pictures, prices and information.